Get discounts to local merchants from a plastic card that fits conveniently in a wallet. Think of it as a credit or debit card without the swiping. 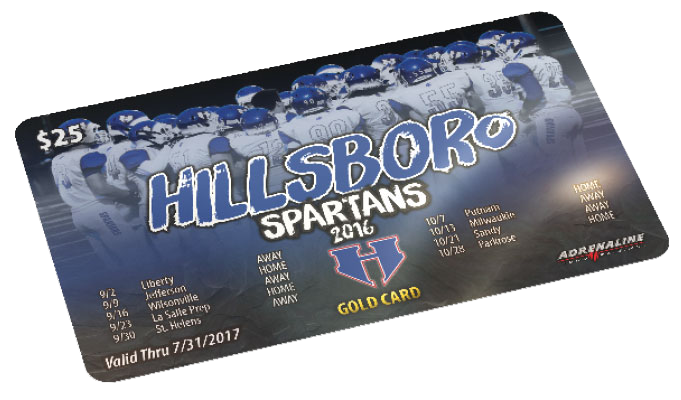 The front of the card displays your group’s logo, photo, and/or schedule. This design is custom made to your specifications. The back contains a list of 16 to 24 local merchants and their discounts. Merchants include restaurants, retails stores, salons, automotive services, and more. Discounts are acquired by Adrenaline Fundraising and are good for one year. Simply present the card at a participating local merchant to receive the discount. It’s easy and convenient. A popular product, Gold Cards are a valuable investment for supporters and for your fundraising needs. First, the key tag consists of a Gold Card. The front of the card displays your group’s logo, photo, and/or schedule. This design is made to your specifications. The back contains a list of 16 to 24 local merchants and their discounts. Merchants include restaurants, retails stores, salons, automotive services, and more. Discounts are acquired by Adrenaline Fundraising and are good for one year. In addition to the Gold Card, supporters can choose discounts from some of their favorite merchants. These discounts come with the Gold Card as Key Tags. Each tag can be separated from the rest of the tags and Gold Card to put on a key chain or wallet. Key Tags are typically one-time use tags, but offers vary by merchant. Simply present the Gold Card or the Key Tag at the participating merchant to receive the discount. Your group has the option of selling one, two, or three key tags.